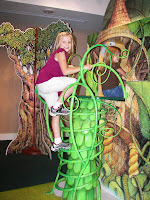 After leaving the St. Louis Art Museum, we headed to the St. Louis Children’s Museum aka The Magic House. It would have cost us $51.00 (8.50/ea ages 1+), but I found coupons HERE and it only cost us $34.00…parking is FREE. We could have spent the entire vacation here, I’m sure. The moment we walked in the door, I thought the kids heads would explode. They didn’t know what to do first. If we had known anything about the different areas, we would have gone to the Fairy Tale portion last. There were a lot of kids in there playing dress-up and it was ridiculously crowded, so they didn’t stay in there long, but I could tell they would have LOVED to play dress up with all the other kids. 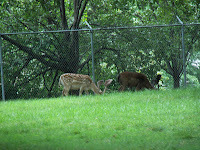 They weren’t bummed out for long, moving on to the next area. While wandering around, we came across an area that had a mystery to be solved. 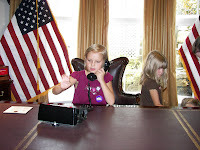 Greg took charge on this activity and took the girls to each station for them to collect the clues to solve the crime. 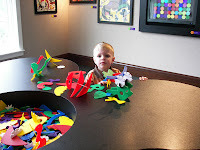 While they did this Grayson and I played with these shape building things. He loved putting them together in his own way. When Greg and the girls disappeared into a hidden passage behind a false bookcase, and were gone for nearly an hour I became very sleepy and totally could have taken a nap if it hadn’t been for the uncomfortable chair and the loud banging accompanied by shrieks of laughter coming from the other side of the wall. Once they returned, they told me all about what they’d done on the other side of the bookcase. The loud banging and shrieking was actually my children (along with other) climbing through an air vent and going down a slide…repeatedly. 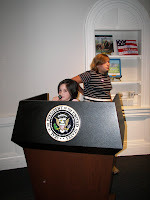 Next we found the Star-Spangled Center where they sat behind a replica of the President’s desk, and made a speech from the podium. 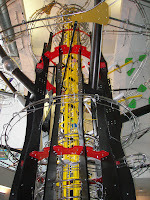 We then made a pit-stop at the air tubes. 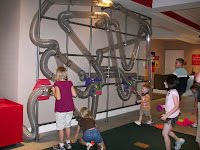 The kids played here for a good 10 minutes…shoving scarves & fluffy balls into the chamber, watching them swirl through the series of tubes, finally shooting out and hitting one or another giggling child in the face. 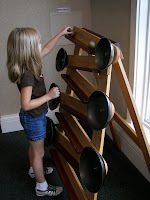 Our next stop was the music play area. 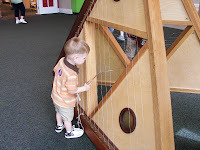 It housed huge instruments that the kids immediately were drawn to and were so proud of their musical prowess that they didn’t want to move to the next area. I had to tell them there was something super cool upstairs and we didn’t have much time. Once I finally convinced them it was going to be well worth it, we moved on. 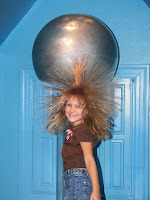 There were brief stops at the air power station and the magnet room…and then the mother of all science entertainment…the electrostatic generator. Grayson refused to go up there with Kara, so I took him. Kara didn’t listen very good to the instructions, and got quite a little shock right before I took her picture. They told her not to take her hand off and if she did, not to put it back on…so, what did she do? Let go, then slapped her hand back on. Zzzzztttt! It was quite comical. There was a charge of $3.50 per photo for them to ‘professionally’ take the picture…I figured I’d save $7 and take my own…they turned out just as good I think. After their ‘hair raising experience’, there was a 3 story spiral slide that the girls went down twice. I tried to get pictures, but they were just colored blurs on a silver background. 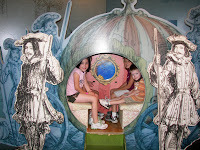 Finally, on our way out, we went through the bubble room. The kids blew enormous bubbles, played the bubble organ, and generally had a lot of soapy fun. They were pretty exhausted by the time we left, so they slept quite a bit on the drive home. Although they slept most of the way, the drive home was not uneventful. While Greg was driving through a remote area of Missouri, I was startled awake by a sickening ‘thwack’ on the windshield. Greg, startled as well, asks ‘What the heck kind of bug was that?’ I reply, ‘It wasn’t a bug, it’s a bat.’ Notice I didn’t say ‘It was a bat.’ I said ‘It is a bat.’ The poor, hopefully dead at that point, creature was stuck in the windshield wiper. There were quite a few ‘Ewww! Ewww!’s from me as it flopped up and back down a few times…I’m hoping just from the wind of driving. We were fairly close to home, so I told him to just leave it alone and he could get it off at the house…plus, I wanted a picture for my blog. I mean, who else does weird stuff like this happen to? I needed proof. Well, about 10 minutes from the house, Greg goes to dim his bright lights, and you guessed it…hit the windshield wiper controls sending our unexpected hitchhiker into the night. So, I am sorry to say, there is no picture evidence of this event. 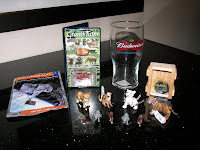 Below are the pictures of the souvenirs we acquired on our vacation. And there you have it…the conclusion of the Alexander 2009 Family Vacation to St. Louis, MO. 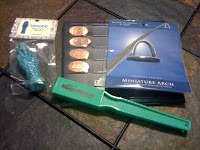 I hope that I have showed you a few ways to save money, without compromising fun, if you are heading to St. Louis. 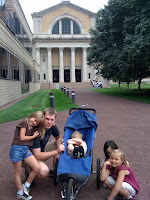 On our final day in St. Louis, after checking out of our hotel, we drove over to the St. Louis Art Museum. Okay, back to the art… Personally, I could have spent the entire day in the Art Museum (if I did not have the kids with me). 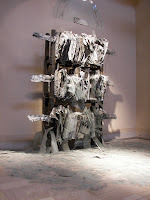 There were many works that I would have loved to admire a bit longer. 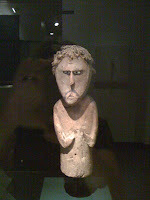 (Forgive me for the pictures…my camera did not do well on the ‘museum’ setting.) 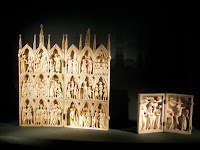 For example, this carving of what I believe is called the 12 Stations of the Cross. Another section I thoroughly enjoyed was the medieval area which housed an assortment of weapons and armor. Some of the swords were taller than me…not that it is a great feat for something to be bigger than me, but a 5′ sword has to weigh quite a bit. 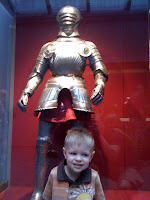 Grayson insisted a full set of armor was actually a robot. I think he was a little nervous that it was going to try to grab him or something. 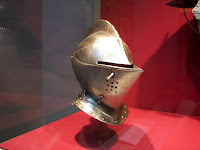 It was very interesting to see the different styles of the armor depending on which country it was from. 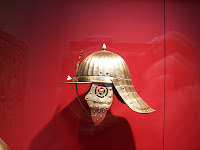 The helm on the left is a French helm, and the one on the right is German. 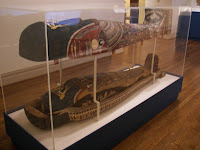 The kids favorite exhibit was the Egyptian Sarcophagus. They were pretty creeped out that you could see actual toes through the wrappings on one of them, but they asked a lot of questions about Egyptian beliefs afterwards. They were very interested in the culture differences and were amazed by how their beliefs were so vastly different from our own. 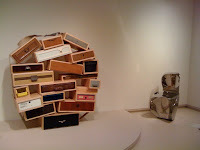 My favorite part of the museum was the abstract art. The exhibit below was huge and was made of metal and glass, and it’s truly remarkable. And finally just a couple pieces I liked. The cute little wooden man for some reason reminds me of my Dad…not sure if it is because it is something he would like or what, but he was one of my favorite pieces. Oh, and yesterday when I said that this post would be the conclusion of the ’2009 Family Vacation’ series…I was wrong. 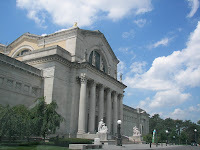 I thought I could combine the Art Museum & the Magic house, but I got a bit carried away with the Art Museum pictures. Tomorrow…the Magic House & trip home. Okay, today I had planned on being able to actually work on something worth reading…like a review or a Thrifty Thursday post, but ya’ know…I’m sick. I have a summer cold that began with a slight sore throat on Sunday, escalated to sinuses so dry it hurts to breathe, and is now sneezing fits and a stuffy yet runny nose. I know I am on the down swing of this, but it still stinks. This week was set to be a busy one with the kids going back to school next week, and I’ve spent the majority of it on the couch. 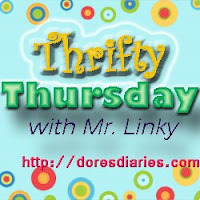 Well, whaddya know…it did turn into a Thrifty Thursday post. I don’t have pictures for anything, but hey…it’s better than nothing! =) Now, I’m off to drink lots of juice, take some Vitamin C, lay down and read. 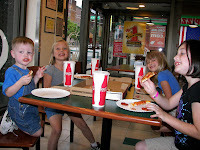 Tomorrow’s post should be the conclusion of the ’2009 Family Vacation’ series. Kara losing her first top tooth (3rd tooth total) …after begging me for 2 days to pull the grossly dangling tooth, out it came. 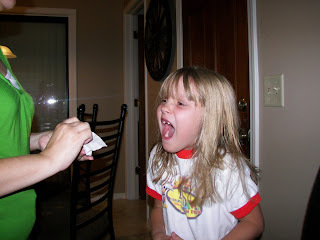 She was very proud of her tooth and that she was going to get her picture taken putting it under her pillow (a tradition at our house) for the Tooth Fairy. 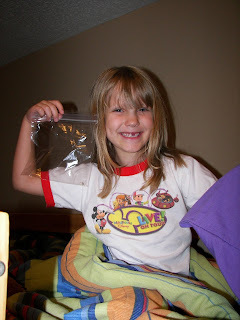 Just in case you were wondering, the Tooth Fairy found the tooth very valuable and left Kara $1.42 under her pillow. OLD NAVY COUPON GIVEAWAY! WINNERS! Can you tell I’m a little excited? I have up for grabs 3 Old Navy Coupons for 3 lucky readers! My Old Navy trips have been temporarily suspended, so I have coupons for 3 of my wonderful readers! I will draw winners using Random.org. First one drawn will win a $50 off $100 coupon, next 2 drawn will receive 25% off coupons. (These coupons expire on 8/13/09.) Entering is simple…do any of the following! *Be sure you leave comments w/ links if you tweet/FB, and put separate comments for each. (Example: Subscribed #1, Subscribed #2 – in separate comments) Also, leave your e-mail in your comment if it is not in your blogger profile. If I can’t find your e-mail to send you the coupon, you can’t win! This week I feel like I was the Thrifty Queen. 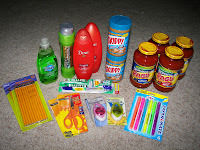 I made another trip to Old Navy (I have a feeling hubby is going to cut me off soon) using the $50/100 coupon I found at oldnavyweekly.com, grabbed a decent amount of school supplies at Staples, and I scored big at Walgreens with a combination of coupons, Register Rewards, and a rebate. 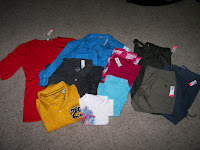 From Old Navy I got the girls each a shirt for school, Greg 2 polo shirts, Grayson a Spider-Man T-shirt, and for myself…2 shirts, 1 shorts, 1 capris, and 1 pants. They were offering an additional 50% off clearance items, so 4/5 of my items were from there. The polo’s were 2/$24.99 (originally 19.50 each), and the girls shirts were on sale, but I can’t remember what it was exactly. I do know, after adding all the original amounts on the tags, this would have cost me $202.50 + tax…I paid $55.84 after taxes. At Staples, (I don’t have a picture for my Staples trip…everything got divided up between the kids before I had a chance to get out the camera.) I got 5 pkg. wide ruled filler paper .01/ea, 2 reams of printer paper $5.99/ea (3.99/ea Easy Saver rebate so really $2/each after rebate), 3 1-subject spiral notebooks .75/ea, Watercolors .90 (accidentally bought these instead of markers…oops! ), 8.5×11 Dry Erase board 5.00 (Greg’s been wanting one of these…figured he deserved a surprise! ), 3 24-ct. Crayola crayons .59/ea, 3 pkg. 4-glue sticks .99/ea, 2 3-hole zipper pouches 2.00/ea. 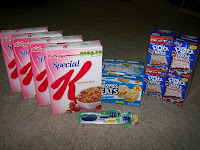 Total of $31.24 after tax plus I’ll get a check for 7.98 (Easy Saver Rebate). Whew! I am worn out from all that saving! Think I’ll take a few days off of shopping… Wait…nope, I can’t. Gotta go grocery shopping on Friday…well, I guess 1 day off will have to do. Prepare yourself, Walmart…I’m coming w/ coupons in hand! 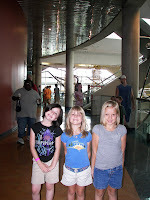 After leaving Grant’s Farm, we headed to the St. Louis Science Center. This fantastic place was also FREE. 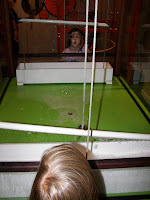 I wish we had been able to spend more time at the Science Center, and that it hadn’t been so crowded. When we first arrived, I planned on being able to really show the kids some cool stuff and them even learning…shhh, don’t tell them. 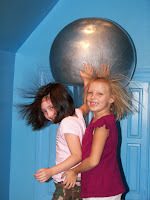 They were immediately fascinated by the Energizer Ball Machine. 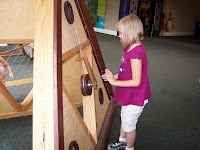 I’m sure they would have been happy to sit and watch this thing for hours, but we had lots of educational fun stuff to see! We started by going through an exhibit about the 5 senses. We learned that Kylie has no sense of smell, Kara is possibly half deaf, Trinity’s balance is a little off (or she is overly dramatic…which is totally possible), and Grayson can throw a serious fit when confined to his stroller. There were all sorts of medical equipment that we explained to the kids including an iron lung and some old creepy looking surgical tools. Next in line was Cyberville. Exhibits included a laser harp, a lego robot class (we just watched them compete), lessons on the evolution of the computer…including binary code stuff which was WAAAAY over my head. We kept trying to explain things to them and all they wanted to do was touch stuff. They had no clue why things were doing what they were doing, but they had a blast making things do random stuff. 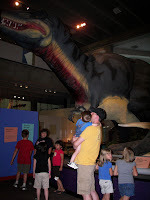 We spent the majority of our time in the dinosaur exhibit. Grayson was very excited to check it out, then lost his enthusiasm when he saw the giant robotic beast. He wanted nothing to do with the enormous T-rex…Trinity on the other hand had fun acting as if she were afraid it would eat her. 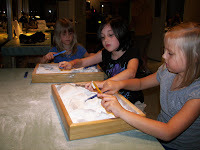 When we finished with our goofiness, we moved on to checking out the actual dinosaur bones. 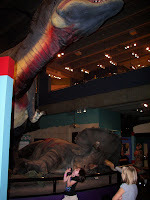 Knowing that dinosaurs were ginormous is one thing, but actually putting it into perspective is another. 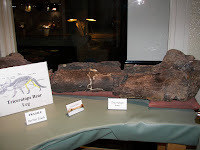 As you can see, the bone below is the femur of a Triceratops compared to the femur of a chicken…does God have a great imagination or what?! As mind blowing as this may be, the highlight of Grayson’s visit to the Science Center (besides the ball machine) was excavating dinosaur bones with a toothbrush. 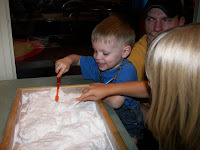 He sat there for at least 10-15 minutes infatuated with brushing the white powder away from the real dinosaur bones. Maybe he’ll be an archaeologist someday. Unfortunately we didn’t have much time at the Science Center, and missed out on so much stuff. 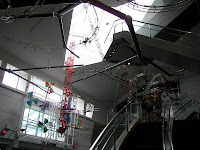 Next time we visit (I really hope to take them back in a few years), we will dedicate an entire day to the Science Center and will for sure spend a large chunk of time in the Planetarium. I was interested in stars, planets, and space travel when I was a kid, and would have loved to explore the different areas of the Planetarium. 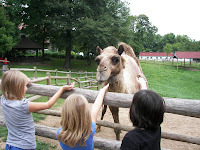 When I first began researching St. Louis as our ’2009 Family Vacation Destination’, I was immediately drawn to the big, well known attractions…St. 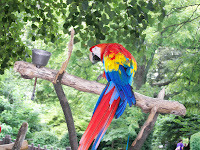 Louis Arch, Six Flags, St. Louis Zoo, etc. 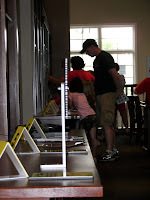 When I realized our vacation budget would be significantly less than originally planned, I really began searching for FREE or very low cost family activities. 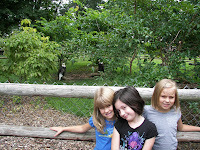 Grant’s Farm was one that came highly recommended by friends, so I thought we’d check it out. (Admission is FREE, parking $11.) 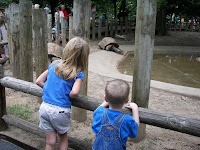 We’d already been to the zoo, and weren’t sure if the kids would want to see animals a second day. 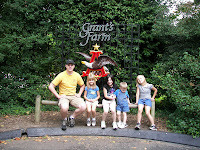 Boy were we wrong… They absolutely loved Grant’s Farm. 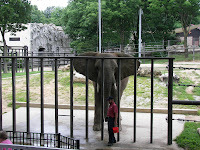 There were animal shows featuring a variety of birds, some rats, a pig, and the kids favorite…Bud the Elephant. Bud the Elephant was pretty cute even though he’s humongous. He enjoyed getting various reactions from the audience for his ‘tricks’. 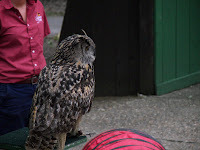 Cheers for carrying a huge log with his trunk, picking a dime up off the ground, reaching high up in the air to retrieve a ball from atop a pole, and ‘Ewwws’ coupled with children’s laughter as he peed and pooped mass quantities. Evidently he does that every show, and loves getting that reaction. Grayson quite enjoyed the giant turtles. One of them didn’t move an inch, the other made his way across the small puddle of water and over close to us. I’m pretty sure Grayson would have touched it if I’d let him. It rained a little here and there, but nothing we couldn’t handle. 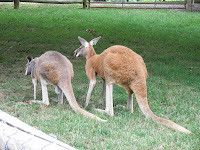 Our visit to Grant’s farm included, visits to all the animals including camels, bald eagles, various parrots, goats, and a pair of male kangaroos that were doing unmentionable things to each other…I am eternally scarred. We even found our way to the Bauernhof (German for ‘homestead). It’s pretty much a giant food court with a gift shop, and it’s the place where you get free beer samples. Fully expecting to get a small punch cup size sample, I hand over my ID to a sweet little old man (who was quite the flirt, I might add). I was surprised to receive a full glass of beer. Considering it was before lunch, I did not want an entire beer…just wanted to taste a sample. (I got a kind I’d never heard of called Stella Artois…it was good, as far as beer goes.) There was a sign indicating there was a limit of 2 samples per day…which if I had taken advantage of these free ‘samples’, I would have been totally hammered. Another cool thing about Grant’s Farm is the tour you get on the tram heading into the farm. 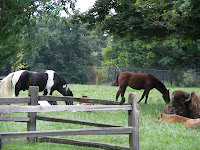 It is where you see the free roaming animals (deer, bison, buffalo, horse, etc. 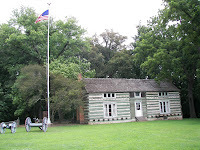 ), and you see the cabin that Ulysses S. Grant built (mostly himself) in the 1800′s. The fence across from the cabin (which I neglected to get an actual picture of, so nabbed the one below from HERE) is made up of over 2,500 rifle barrels as a Civil War memorial. A very unique memorial, that I found quite interesting and beautiful.